This Mother’s Day can be a healthy treat for mom with several fruity meal ideas that you can prepare for breakfast lunch or dinner. You might want to make a list of her favorite fruits then seek the best and most fresh produce available to make her day a special one. If you would like to surprise your mother in the morning there are a few ways to do this. Some ideas for tasty breakfasts could include blueberries with honey or Agave infused vanilla yogurt with graham crackers, and topped with crumbled dark chocolate. If she loves strawberries, which are coming in season, consider making strawberry shortcake, pancakes or waffles. Blueberries and raspberries also make great choices for your favorite gourmet muffin recipe, which can be topped with sweetened cream cheese for added decadence. For lunch you can indulge your mom with a gourmet salad mixed with luscious greens, avocadoes, raspberries, strawberries, tomatoes, red bell peppers, mushrooms, honey glazed walnuts, salmon and goat cheese. Top it off with honey mustard or poppy seed dressing. Add a bagel and lox with cream cheese, which can also be complimented with sliced kiwis and ruby red grapes. If dinner is what you prefer you can still bring on the fruit. Keep in mind the type of dish you are preparing. For fish and seafood try citrus fruits. There are many varieties of oranges available right now that are both sweet and tangy. Meyer lemons are also a great choice and are sweeter than regular lemons. Poultry dishes can be preceded by a delicious Waldorf salad or fruit salad mixed with melons, bananas, blueberries and grapes. With other meats you could incorporate figs, pears, apples and fresh cranberries. 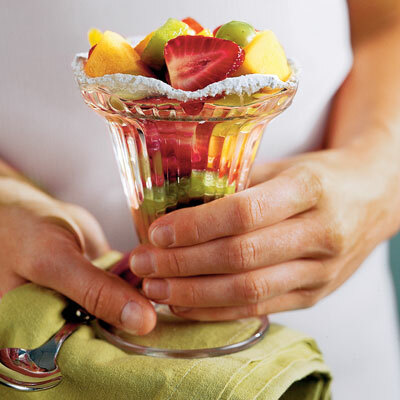 The possibilities are endless when it comes to adding healthy fruit to your Mother’s Day activities. Not only is this a fresh surprise, but can also make any meal gourmet.